It may seem logical to think that fresh fish is always better than frozen, but actually, that may not always be true. Modern freezing techniques make many of the fish in the freezer section superior to those in the case nearby. This is because lots of fish are now frozen directly on the boat, just minutes after being caught, in flash-freezing units that maintain a temperature far below the typical home freezer. And farm-raised fish is frozen on the spot, as freezers are incorporated into the farm site. Since more than 85 percent of the seafood we eat is imported, most of this fish is frozen before it makes it to our local fish market or grocery store. Some fish that is labeled "fresh" are in fact previously frozen, and while reputable fishmongers will reveal this, not all fish markets do. Something to think about when choosing between fresh and frozen fish is your geography: Do you live within 100 miles of a coast or Great Lakes? If so, then buying fresh fish is a good idea, as long as the fish you are selecting are local and in season. You can get excellent fresh fish inland, but the prices will be far higher and the quality of the fish can be questionable. Lobsters are a classic example: They don't travel well, and eating a live Maine lobster on the West Coast is not the best idea—they will be in poor condition and will be twice the price of the same crustacean in Bar Harbor or even New Jersey. If you want Maine lobster in California, it is best to get the tails flash-frozen. Incidentally, the same holds true for Easterners who want Dungeness crab. There is clearly a case for buying frozen fish, but not all frozen fish are created equal. There are some markets where there are rows after rows of fish simply tossed into a styrofoam package and plopped in the freezer. You don't want to buy that. To find the best flash-frozen fish, you need to look for one of two things: A vacuum-sealed fish—these are always your best bet—or a fish with a thick glaze of ice on it. This is an older method of freezing that protects the fish well. 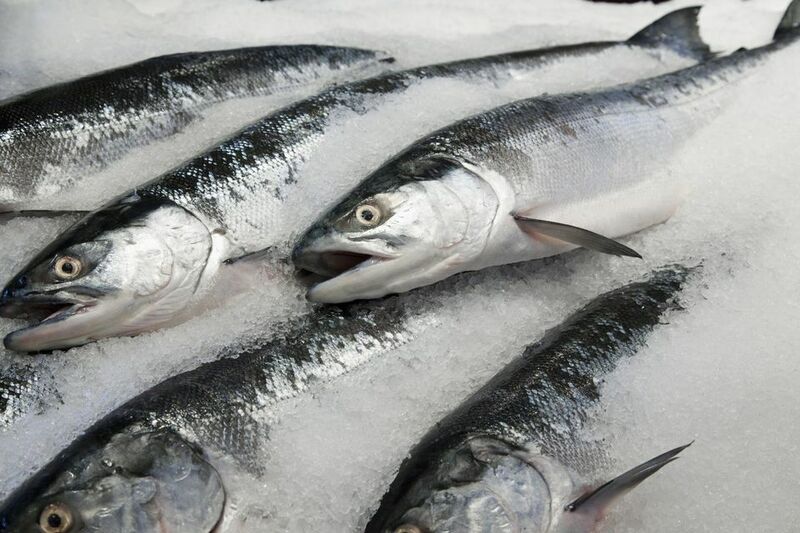 And whether you are buying fresh or frozen fish there are telltale signs if the fish has been stored properly or not. If you are buying whole fish, you want to make sure the eyes are clear and not cloudy. If you're after fillets, the flesh should be uniform in color and not faded looking, which signifies the fish is aged. There are many good reasons to buy frozen fish, including taste, convenience, and price. Since the fish is frozen at its peak of freshness, all of its flavor and nutrition, as well as its texture, is locked in. And as long as the fish is frozen properly, it doesn't matter if they are fatty or lean, or thick steaks or thin fillets. When it comes to convenience, nothing beats frozen fish. Imagine it's the end of a long day, you haven't planned dinner, and you want to cook something up quickly. Those well-packaged frozen fish fillets are your answer! They can be thawed easily, simply placed in a bowl of hot water (put the fish in a resealable plastic bag first) until the fillets can bend a bit. If you have a lean fish, such as cod or tilapia, you can put them directly in the pan or oven—no defrosting needed. Freezing also extends the season of the fish, making a fish that is caught in the summer a delicious treat in the middle of winter. And as you may have suspected, frozen fish is more affordable than fresh—approximately 20 percent cheaper.